Agents specify wrap-up codes to indicate the purpose or outcome of an interaction. For example, an agent can indicate a completed sale, a customer dissatisfied with service, or a billing problem. 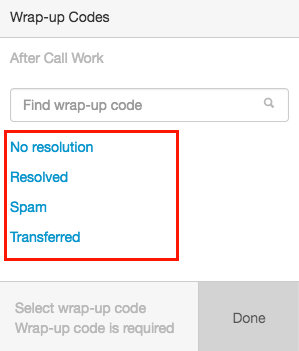 Specify wrap-up codes in the Wrap-up Codes panel during the interaction or during after call work (ACW). 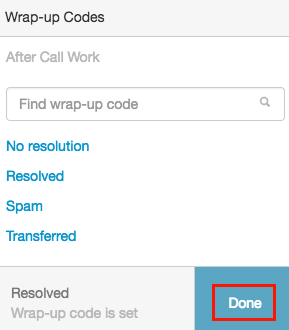 The Wrap-up Codes panel opens automatically after an interaction ends.